As you probably know, we're great admirers of the Broad Ripple Brewpub's award-winning beer auteur, Kevin Matalucci. Therefore, as a tribute to Kevin and all that the BRBP has to offer, we present to you Kevin's latest cinematic masterpiece: "2001: A Stout Odyssey." Over images of an African desert, a caption reads, "The Dawn of Craft Beer Man." Near a primitive watering hole in the desert, a group of apes Bud Light drinkers are foraging for food. One of them is attacked and killed by a leopard. They are driven from the watering hole by another tribe of swill drinkers. Defeated, they sleep overnight in a small exposed rock crater. Waking at sunrise, they find that a barrel of deep, dark-black stout from the Broad Ripple Brewpub has appeared in front of their shelter. They approach it shrieking and jumping, amazed at its chocolate-syrup-like nose. They take a drink, first noticing the light, watery front, but also the way the oaky/woody flavors and the chocolate-milk-like flavors meld. Soon after that, one of the apes Bud Light drinkers realizes that beer as tasty as this is not only art, but also a tool and a weapon. After drinking this beer, the tribe of Bud Light drinkers has now evolved in some way and are seen eating meat in a subsequent scene. The next morning, they wrest control of the watering hole from the other tribe of swill drinkers, killing the other tribe's barkeep in the process. Triumphant, the ape leader leader of the former Bud Light drinkers throws a Bud Light tap handle into the air, which switches via match cut from a close-up of the tap handle to a long shot of an orbital satellite millions of years in the future. 3.76 Mugs. An IndyGo space plane flies Dr. Heywood R. Floyd to Space Station 842 in an elaborate rendezvous and docking sequence, which include iconic and stylish representations of life on a space station (including a view of the station's pub, which is appointed with gleaming white furniture, fixtures, and tap handles). After clearing voice print identification, Dr. Floyd makes a videophone call to his daughter to wish her a happy birthday and to remind her to remind her mother (Floyd's wife, Susie) to send him a pin of his favorite beer, Broad Ripple Brewpub's Monon Porter. Later, strolling down the main corridor of Space Station 842, he joins a group of brewers, telling them that he is on his way to Hopcicle Base, a U.S. base on the moon. One of the brewers, Dr. Theodore Miller, queries him about what has been going on there, but Floyd declines to answer any more questions when they press him about the rumor that an epidemic has broken out at the U.S. base. Floyd travels to Hopcicle Base in a moon shuttle. There he heads a debriefing session, apologizing for the epidemic cover story. Floyd’s actual mission is to investigate an artifact dug up on the moon, initially detected by its heavy, port-wine-like odor and named "2ASO" ("2001: A Stout Odyssey"). Geological evidence shows that the artifact was deliberately buried near the crater Tycho four million years ago. Floyd rides in a moonbus to the site. In a large pit dug around it, the artifact is an intact barrel of beer identical to the one encountered by the apes former Bud Light drinkers. 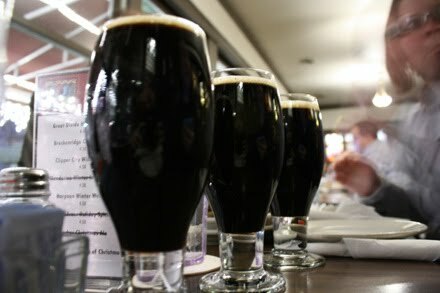 The visitors examine and taste the beer, finding it to have a purple-black color and pleasing flavors of molasses, dark fruit, and coffee. They then pose for a photo in front of the barrel. As they do, the sun rises over the top of the barrel, which emits an overpowering odor of dark chocolate. 3.95 Mugs. A title caption reads "Jupiter Beer Mission: Eighteen Months Later." On board the spaceship Fermentation One, bound for Jupiter, are two mission pilots, astronauts Dr. David "Dave" Bowman and Dr. Francis "Frank" Poole, and three scientists in cryogenic hibernation. Also along for the trip is the ship’s computer, HAL 9000, which Dave and Frank address as "Hal." Hal runs most of the ship’s operations. We've been on the mission for 18 months now. Freeze-dried space beer is not very good. I've been trying to explain to Hal why humans enjoy beer so much but he doesn't seem to understand why maltose water would be enjoyable. Yesterday Hal sent me out in an IndyGo spacepod to replace the AE-35 unit but when I reached the unit it was in perfect operational condition. While I returned the new unit to storage I happened upon a large wooden barrel full of liquid. When we opened it we were greeted by aromas of fortified wine, dark chocolate, coffee, and raisins. Could this be real beer? Real Earth stout aged in a real Earth barrel? Hal insisted this was a human error and that the barrel was garbage. I spent all day today trying to explain to Hal why this beer was important. 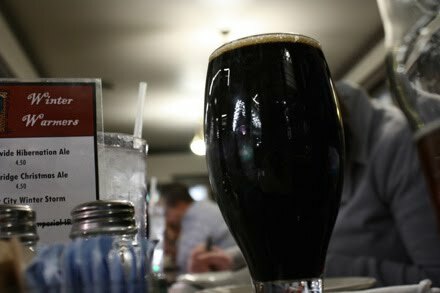 I tried to explain the port and brandy complexity, what malted milk feels like in my mouth, and how the beer's flavor reminded me not of cherries, but of cherry cordial. He seemed to understand that this beer would have coffee and chocolate flavors, but the notion of plums in beer were beyond his definitions. Frank pulled me aside into a spacepod and told me that he didn't trust Hal with the barrel, that Hal couldn't understand how wonderful it was, and that if Hal destroyed the barrel he would have to be deactivated permanently. I definitely agreed; this beer is too important. 3.90 Mugs. As the film resumes, we see Frank as he attempts to conceal the barrel of beer in an IndyGo spacepod outside of Fermentation One. The pod, which is controlled by Hal, turns and accelerates towards Frank, severing his oxygen hose and setting him adrift into space. As a result, Dave goes out in another spacepod to recover Frank's body. While Dave is gone, Hal terminates the life functions of the crew members who are in hibernation. When Dave returns to the ship, he asks Hal to open the pod bay doors to let him inside. Hal refuses to do so, stating that Dave’s plan to disconnect him jeopardizes the mission, saying, "I'm sorry, Dave. I'm afraid I can't do that." Consequently, Dave enters the ship manually through the emergency air lock. Dave makes his way to Hal's logic memory center to disconnect Hal. Hal tries to reassure Dave that everything will be all right and that there's plenty of the luscious beer from the barrel to go around, but Dave ignores him. Good day, gentlemen. This is a prerecorded briefing made prior to your departure and which for security reasons of the highest importance has been known on board during the mission only by your HAL 9000 computer. Now that you are in Jupiter's space, and the entire crew is revived, it can be told to you. Eighteen months ago, the first evidence of intelligent life off the Earth was discovered. It was buried 40 feet below the lunar surface, near the crater Tycho. The origin and purpose of this artifact--a four-million-old barrel of beer--is still a total mystery to us. The only clue available to us is a single, very powerful odor of chocolate and dark fruit that the barrel emitted toward Jupiter. That is why we have sent you there--to discover the true purpose of this barrel of heavenly ale. Dave leaves Fermentation One in an IndyGo spacepod and encounters another barrel of stout in orbit around Jupiter. Approaching it, Dave finds himself suddenly traveling through a tunnel of colored light, racing at great speed across vast distances, viewing strange astronomical phenomena along the way, including rubies dancing around the edges of a pint of chocolate and toffee stout and concluding with landscapes containing altered colors. He eventually finds himself in a bedroom in Broad Ripple containing stylized English decor and smelling of cherries, grapes, and oatmeal. He repeatedly sees older versions of himself, with the film's points of view each time switching to the older Dave, all while tasting port flavors, oak, and chocolate. Finally an elderly and dying David Bowman is lying on the bed. At its foot a barrel of stout appears. It transforms him into a god-like being enclosed in a transparent firkin of light. 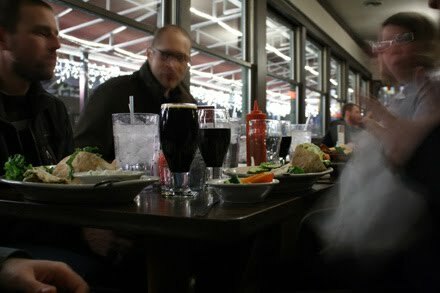 The final shot shows the “Beer-Child” floating in space next to the Earth in a pod of chocolaty goodness. 4.30 Mugs. My comrades spent too much time on the writing and not enough drinking the beer, me thinks. I would easily have given this 4.75 mugs. I'm surprised it was rated so lowly. Maybe next time your won't let an excuse like "It's snowing, the roads aren't clear, and I was just spent like 3 hours in Broad Ripple an hour ago" get in the way of contributing to the site for the benefit of our readers. Think of the readers, Jason. Dark Lord Day 2010 Has A Date..
Should You Blue Moon Grand Cru?